Experiencing local flavor is always a goal of ours while on the road. One of our favorite places to find it is craft breweries, because these days it seems almost every town has its own. While having lunch at Great Lakes Brewing in Cleveland on the first day, I decided to note each beer we drank or tasted on the trip. The total went way above what I anticipated, with a final tally of 75 beers from 30 different breweries. We visited 12 in person (ok, one was a cidery) and the rest we experienced at local bars and restaurants. We didn’t take a sip made in a state or province we didn’t visit, and that wasn’t on purpose, there are just so many ways to drink local we never had to imbibe out of region. If we had to pick a favorite, it would probably be Boxing Rock in Shelburne, Nova Scotia because of its combination of well-crafted beer and cool environment (plus they have a killer logo/branding, so that never hurts in my opinion). Above is a map of the breweries and below is a list in chronological order, followed by the varieties we had. 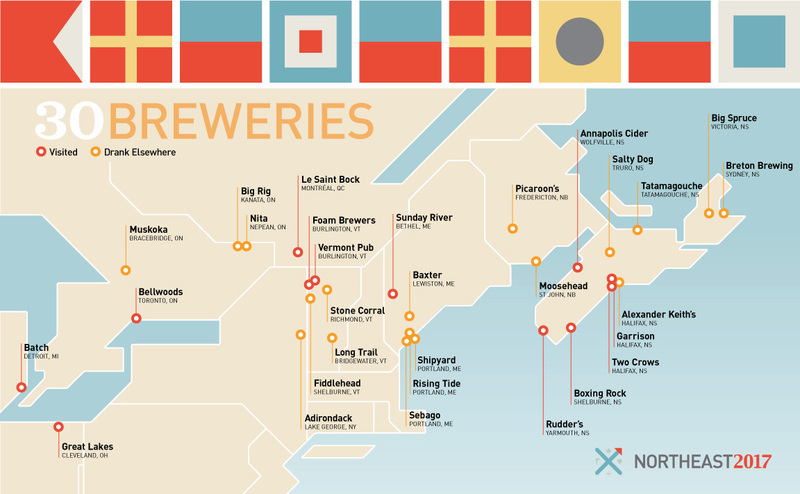 This entry was posted in Destinations, Maps, Travel Resources and tagged Beer tourism, Breweries, Maine Beer, Montreal Beer, New Brunswick Beer, Northeast Breweries, Nova Scotia Beer, Ottawa Beer, Toronto Beer, Vermont Beer. Bookmark the permalink.